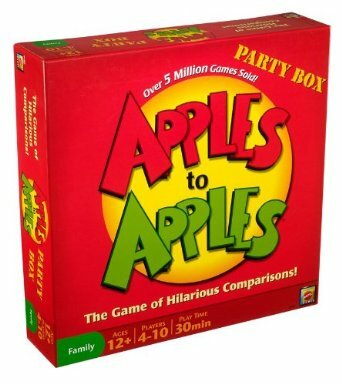 Apples to Apples is an award-winning party game that will have everyone laughing. We had a blast playing this game and think it is a perfect game for a "board game night" with friends and family. It is quick to set up, easy to learn, challenging, and a whole lot of fun. Apples to Apples are the game of hilarious comparisons. It's as easy as comparing apples to apples just open the box, deal the cards, and you're ready to play. Select the card from your hand that you think is best described by a card played by the judge. Hilarious fun for four to ten players, Apples to Apples® is great for game nights with family and friends! This award-winning party game contains over 1,000 cards for hours of entertaining play! Each round is filled with surprising and outrageous comparisons from a wide range of people, places, things, and events. For ages 12+.